The personal injury law firm of Foran & Foran, P.A. is the product of years of experience in the practice of personal injury law. 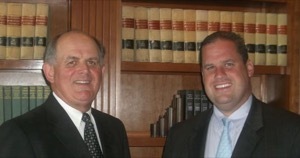 John R. Foran began his practice of law in 1972. He quickly became a principal in a law firm that developed into a highly skilled group of attorneys that engaged primarily in the practice of all aspects of personal injury law. For John, the culmination of this development occurred when his son, Ryan, joined the practice in 1998 and subsequently became his partner. John and Ryan continue to provide services to clients concentrating mostly in all areas of personal injury law. Over the years, lawyers of the firm have represented clients in a wide range of cases including, but not limited to accidents involving automobiles, trucks, motorcycles, trains, Metro/Amtrak, motorcycles, boats, pedestrians, explosions, electrocutions, airplanes, workers compensation claims, medical malpractice claims, slip and falls, dog bites, products liability and social security disability cases. Foran & Foran, P.A. has been recognized in Martindale-Hubbell Law Directory as a member of the Bar Register of Preeminent Attorneys in Maryland which is limited to attorneys who have demonstrated the highest level of legal ability and adherence to professional standards of conduct, ethics, reliability, and diligence. The firm has an AV rating, which is the highest rating available under Martindale Hubbell guidelines. The firm has recovered millions of dollars on behalf of clients for injuries they have sustained in accidents. Regardless of the attorney who represents you from our firm, we promise the very best advice in all areas of personal injury law. You deserve to expect zealous, creative, ethical, knowledgeable, aggressive, and expert representation from us. We have a strong commitment to continuing legal education in order to maintain an extensive and current knowledge of the law. We believe that communication with our clients is the cornerstone of excellent attorney-client relations. Your case will be treated with utmost importance and professionalism because we understand that it is very significant to you and, in many cases, can be a life altering event. Foran & Foran, P.A. is conveniently located in Capital Office Park , 6301 Ivy Lane, suite 600 Greenbelt , Maryland 20770 . The Green line of METRO and a short shuttle bus ride on the bus marked "Courthouse", will drop you off near our office. We are across the street from the U.S. District Court on Cherrywood Lane . Our office is in the building on the same side of the road as and next to the Greenbelt Marriott. There is free parking in front of our building. Take the Baltimore Washington (Gladys Noon Spellman) Parkway north. Take to Beltway exit (Route 495) west towards College Park . Take the first exit which is Kenilworth Avenue (Exit 23). At the end of the exit ramp, take a right at the traffic light onto northbound Kenilworth Avenue . Proceed approximately 300 yards and take a left at Ivy Lane . We will be on the left hand side, the last building past the Greenbelt Marriott. Take 95 South to the Capital Beltway (Route 495) and proceed towards College Park . Take the Kenilworth Avenue Exit (Exit 23). At the top of the exit ramp, cross the median and take a left onto Kenilworth Avenue . Proceed on Kenilworth Avenue for approximately ¾ mile and take a left onto Ivy Lane . We will be on the left hand side, the last building past the Greenbelt Marriott. Get onto the Capital Beltway (Route 495) and proceed to exit 23 ( Kenilworth Avenue ). At the top of the ramp, take a left onto Kenilworth Avenue (North) and proceed for approximately ¾ mile to Ivy Lane . Take a left onto Ivy Lane . We are the last building past the Greenbelt Marriott. Take Route 50 west to the Capital Beltway (Route 495). Proceed to exit 23 ( Kenilworth Avenue ). At the end of the exit ramp, take a right onto Kenilworth Avenue north . Proceed for approximately 300 yards and take a left onto Ivy Lane . We will be the last building past the Greenbelt Marriott.